A process essay is one of the easy writing tasks that is aimed at teaching someone how to do something. The main objective behind creating this essay is to help others to understand how a definite process runs. A sample process essay usually provides an example of the step-by-step process description. The topics for the essay might vary, starting from description of meeting the new people and to the discussion of the operation of engine manufacture. This sample process essay will be dedicated to the description of the process of taking a picture. Taking an excellent picture is not an easy task as far as it is necessary to consider a wide range of factors. It includes the setting of the camera, the observation of the environment, the choice of perspective, and finally the pressing of the button on the camera. These stages of taking a photo are recognized as essential by the professional photographers and should be accomplished in order to create an outstanding picture. The initial step towards shooting a great photo is the observation of the environment. It requires from the photographer to find an interesting object that would be the focus of the photo. After the central object for the picture is found, it is necessary to determine the background and envision how the environmental factors would impact the representation as well as to think about the composition. For example, it is important to consider the lighting, what parts of the picture should be highlighted and what parts can stay with the lesser amount of light. Here, the direction of the light flow is of high significance and should be obligatory considered by a photographer. The next step after choosing an object and deciding on the appropriateness of the light would be the choice of perspective and development of the composition. It would be great to try different angles and to find the one that would be unique. One can think of creating an illusion with the chosen subject. While choosing a perspective for the photo, one can also think about the background and try playing with the negative space, for example. Photos with the perfectly considered background would win in their creativity and organization. Then, the process of taking a photo also involves the setting of the camera. It is important to know what mode to use. For example, when the natural lighting is insufficient, it is necessary to use a flash to enhance the quality of the picture. Besides, for taking a picture of a moving creature, it might be beneficial to choose a respective mode on the camera. Now, after the camera is set in accordance with the environment, one has already accomplished the largest part of the process of taking a photo. To finish the process, one would still need to press the button and finally shoot the picture. Here, it is vital to remember that it might be better to take several pictures at a time and then choose the best one. 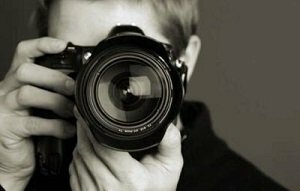 Now, a great and exciting picture is finally taken, and it is time for the photographer to enjoy the awesome result of the lengthy process of taking a photo.